LLUCH patient Precious Baltazar, 14, from Riverside, was one of many children who was able to enjoy Ell’s soulful music. LOMA LINDA, CA – January 29, 2018 – Loma Linda University Children’s Hospital (LLUCH) patients were treated to an afternoon of live country music with emerging artist Lindsay Ell. The 28-year-old stopped by the acute adolescent care unit on Wednesday, Jan. 24 and sang a few songs from her debut album “The Project,” as well as a few cover songs from some well-known artists. Click here for video of Lindsay Ell. 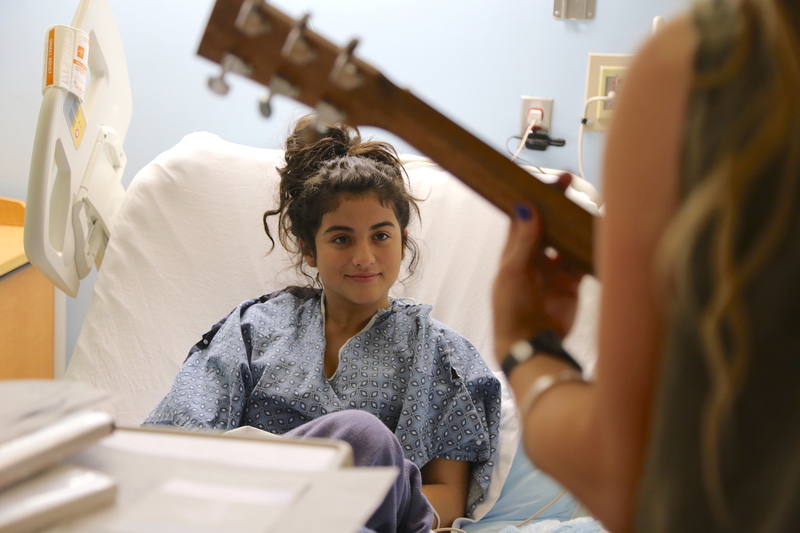 LLUCH patient Precious Baltazar, 14, from Riverside, was just one child who was able to enjoy Ell’s soulful voice and guitar. In between songs, the two talked about music and the future. Baltazar said she hopes to go to Harvard after high school and loves music. “I listen to a little bit of everything,” she said. Ell’s visit was made possible by Inland Empire-based country radio station K-FROG FM, which has a long-standing relationship with LLUCH. LLUCH Foundation representative, Tiffany Hoekstra, was grateful to K-FROG and Ell for making the day of patients. “For a few sweet moments, the pain and worries were replaced by enormous smiles and joy,” Hoekstra said.